What makes Twitter different from other social networking websites is its short 160 words tweet in which you have to put your thoughts in short form. For me its an art which many of possesses but very few had mastered!!! Just like Twitter an app by them named Vine, which allows you to make a 6 seconds short video with cut-loops-and-more. reports 13 million users app for creating not only six second video clips, but also amazing animation creations. The latter capability is all thanks to Vine's most unique feature: the ability to stop and start recording video with a tap on the screen. Expert users manage to turn six seconds into dozens of taps for smooth, engaging animated tales. 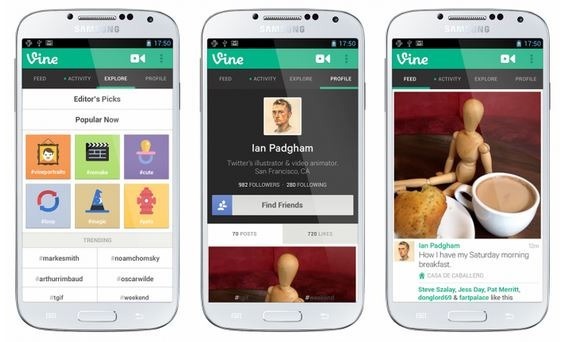 To download Vine for Android now, just search for "Vine" in the Google Play store — it comes up under Vine Labs, Inc.
Vine for Android shares many of the same features as the iOS version. According to a Twitter blog post, the new app includes automatic playback and sound, Explore, popular and trending posts, Find Friends and invite others to join. Now, however, iPhone users may have cause for jealousy: Vine for Android includes a zoom feature, which does not exist on the iOS version. On the other hand, some recent updates to the iPhone app are not included in the new Android build, such as front-facing camera support, search, mentions and hashtags. Twitter promises those will all arrive soon.